Black Mountain Mennonite Mission (part of Mennonite Church until about 2006), Chinle, Arizona, was established in 1953 as a mission among the Navaho People by the Mennonite Board of Missions and Charities. In 1958 it had 13 members, with Stanley Weaver as pastor. In 2006 it was a member of the United Native Ministries Churches. After United Native Ministries ended it became part of the Anabaptist Native Fellowship. In 2006 it had 13 members; Daniel Smiley was the minister. Anabaptist Native Fellowship. Newsletter. (November 2008). http://www.harvestfellowshipofchurches.org/pictures/ANFfall2008Newsletter--pg.1-4.pdf (accessed 20 August 2009). Bender, Harold S. and Sam Steiner. "Black Mountain Mennonite Church (Chinle, Arizona, USA)." Global Anabaptist Mennonite Encyclopedia Online. August 2009. Web. 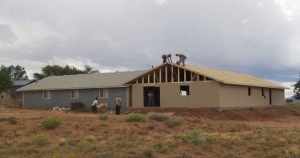 18 Apr 2019. http://gameo.org/index.php?title=Black_Mountain_Mennonite_Church_(Chinle,_Arizona,_USA)&oldid=91135. Bender, Harold S. and Sam Steiner. (August 2009). Black Mountain Mennonite Church (Chinle, Arizona, USA). Global Anabaptist Mennonite Encyclopedia Online. Retrieved 18 April 2019, from http://gameo.org/index.php?title=Black_Mountain_Mennonite_Church_(Chinle,_Arizona,_USA)&oldid=91135.